Some carving jobs are large, large, large, some are small, small, small. For example, I’m in the middle of a large sign carving – approximately 4 ft by 5 ft, which requires special jigging in my small shop. It’s going to take me a while to finish that one. But then there are smaller jobs that present their own challenges. This one came to me via a fellow wood worker, Chris Wong of Flair Woodworks fame. He contacted me a few weeks ago because a client of his had just purchased one of his very unique cribbage game boards and wanted some letter carving done in it for a special Christmas gift. Chris wondered if I would be interested in doing this for his client. I jumped at the chance for several reasons. 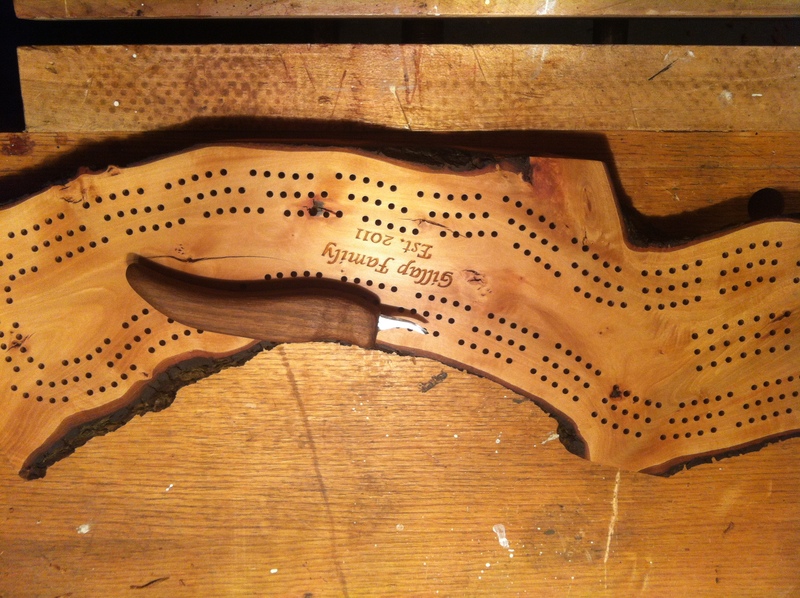 I really enjoy letter carving, and this cribbage board is really cool, plus it would be a chance to collaborate with a fellow woodworker who I respect very much. The perfect triad. The client was wonderful to work for – someone who left me with enough creative license to present some options to her, but also someone who knew enough of what she wanted to give me direction when I asked for it. All-in-all, I think the project turned out quite well.